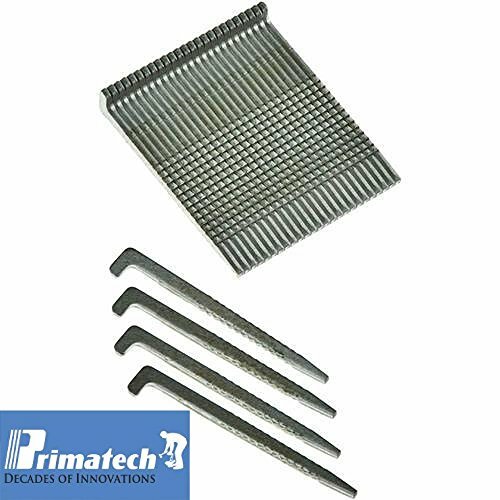 Primatech 2 Inch L-Shaped Steel cleats / nails are used for the installation of hardwood flooring and can be used in many makes of both manual and pneumatic floor nailers. Designed with collated tape, the nails hold together and waste and breakup is minimized. The sharp tips and barbed edges make allow for effective penetration and tongue split prevention, providing the correct amount of holding power. The resin coating adds subfloor retention strength and ensures the maximum hold when installing tongue and groove floors. Please note: Coverage for flooring cleats on board size, cleat spacing, and product manufacturers' recommendations. Please compute quantity of cleats necessary for the project prior to ordering. 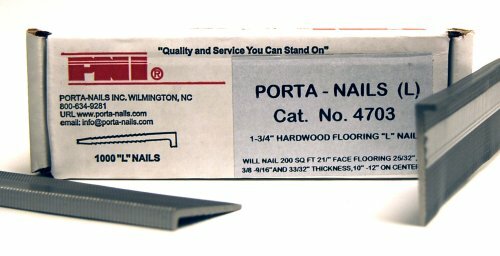 PORTA-NAILS, 1,000 count, 1-1/2", 16 gauge, L nails, for use with PORTA-NAILS 470a 16 gauge nailer, TV #705-816.This product adds a great value. Product is highly durable and very easy to use. This product is manufactured in United States. 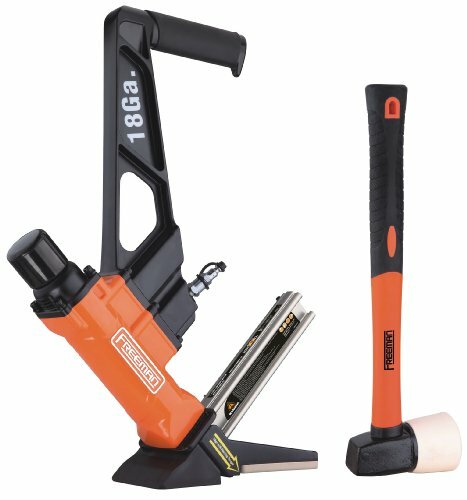 The Freeman 18ga L Cleat Flooring Nailer offers an affordable solution for the professional and do-it-yourselfer for installation of hardwood floors such as Bamboo, Teak and other exotic woods. The drive blade is made of hardened steel with an aluminum cylinder and high-quality rubber O-rings. The body of the nailer is constructed of die-cast aluminum to stand up to the task of daily use. Generic L Cleats may be used with this model, however Freeman L Cleats are recommended. 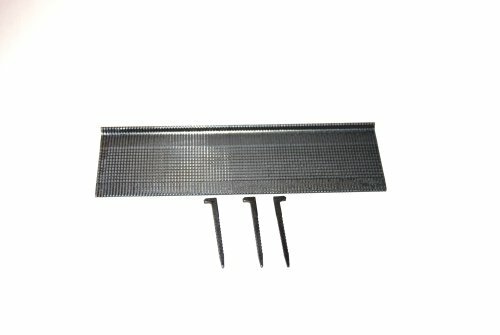 This nailer comes with 3 different sized base plates that provide stability and will protect the surface from scratches. 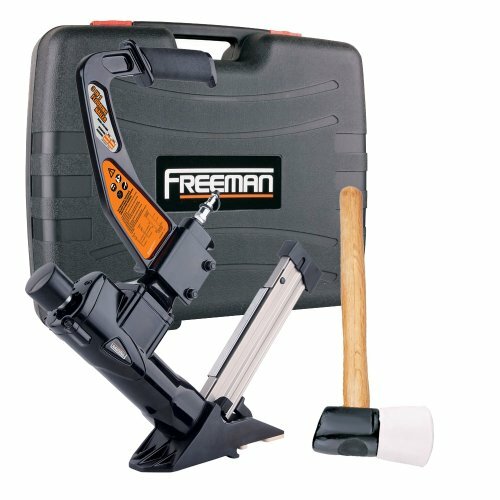 Oil, wrenches, fiberglass mallet with a white, no-mar head, and user manual are included, backed by Freeman’s 7 year limited manufacturer’s warranty. 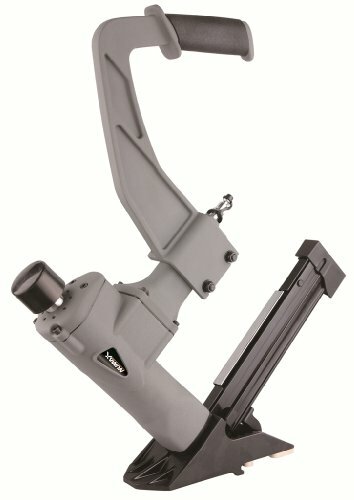 Freeman PFL618BR Features: -3-in-1 Flooring gun with hard case. -Anodized aluminum magazine. -Air filter / anti dust cap. -One piece driver blade. -Interchangeable face plates. -White rubber mallet. -Durable plastic case. -Oil, goggles and wrenches included. -3-in-1 design fastening system. -7 Year limited warranty. -Dimensions: 22.75" H x 16.75" W x 3.5" D. Specifications: -Fastener gauge: 15.5 (staples) 16 (cleats). -Fastener range: 1.5" - 2" and 0.25" crown staples from 1.5 - 2". -Operating pressure: 70 - 115 psi. -Magazine capacity: 100 - 120 pcs. The 3-in-1 flooring nailer from NuMax is great for the professional and homeowner alike. This nailer is easy to operate and conveniently shoots all three types of flooring fasteners; flooring staples, T-Cleats, and L-Cleats ranging in size from 1-1/2” To 2”. Long. 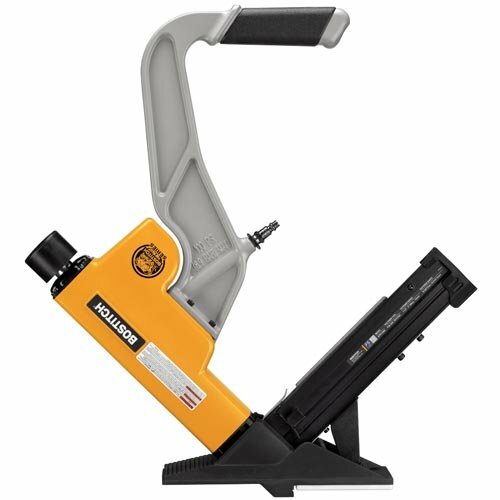 The NuMax nailer has a long handle that provides more comfortable use, and the two interchangeable base plates allow you to install ½”, 15/32”, 5/8”, 19/32” ¾” and 25/32” Tongue and Groove Wood Flooring. The NuMax flooring nailer also comes with a non-marring white rubber mallet, oil, and wrenches. The NuMax flooring nailer is backed by a one year warranty. The NuMax nailers offer the best option for renting a flooring nailer due to its overall value in the flooring nailer category, quickly justifying its cost of rental fees and time lost picking-up and returning the tool. Owning your flooring nailer allows you to work at your own pace and sure the job is done right and not rush through it to avoid additional rental fees. 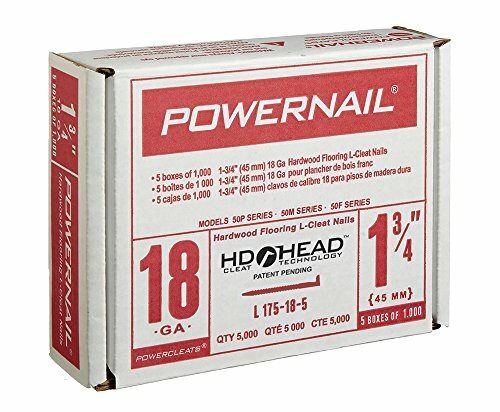 Powernail's 18 Gauge Powercleats are designed to provide maximum holding power for the effective installation of tongue and groove hardwood flooring. The 18 gauge cleat was developed to install the harder varieties of wood flooring without splitting tongues and damaging the nail pocket. PowerCleats are FHA and VA approved. Powercleats are superior quality L-style cleat nails designed to ensure trouble-free nailer operation (fewer jams) and optimum construction results. 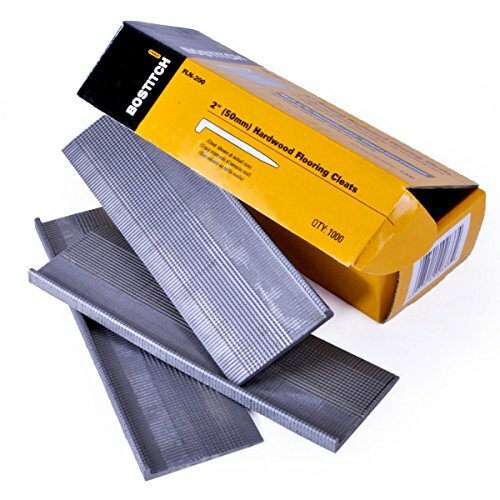 1,200 pack, 1-1/2", 18 gauge, Porta L head flooring nails, use with portamatic evolution #418a.This product adds a great value. Product is highly durable and very easy to use. This product is manufactured in china. Copyright © Wholesalion.com 2019 - The Best Prices On Hardwood Floor Cleats Online.